Seeking links to good knife edging techniques material. I'm researching knife edging, if any of you have photo's of your own projects you can add to this thread, or know of some great links for information please add it here, trying to learn all I can about the technique. 1. After installing the diodes and collimating the beams mount the module in vertical position so the beams are pointed to the ground. 2. Mount the mirror holders with an offset of slightly more as the beam width. We use spacers printed with a 3d printer. Counting from left to right the first mirror mount needs to be at the closest position to the diode block (keep in mind to leave enough place for the prism). 3. Turn the diodes on slightly above the threshold current to pre-adjust the first (closest) mirror. Place it in front of the beam as close as possible to the edge. 4. Set the output power to a value from which the beam doesn’t change the profile / size by rising the current. 5. Adjust the mirror to get the whole beam on the mirror but still keeping it as close as possible to the edge. 6. 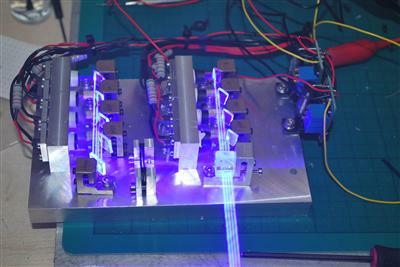 At this step we turn the UV source on. 7. Continue steps 3-7 for the remaining three prisms. Note: As glue we use NOA61 UV glue from Thorlabs. Credit goes to things for the awesome diagrams! 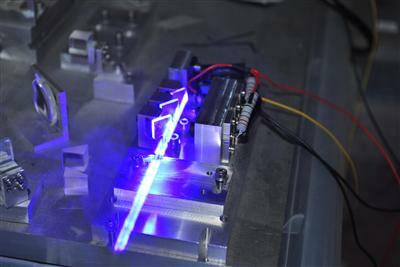 Combining lasers of the same wavelength multiple times. Knife Edging is the method of stacking beams next to each other. This can be done as many times as desired. 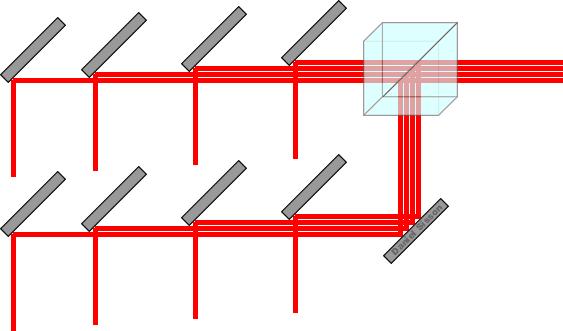 Multiple laser diodes are lined up in a row, and reflected at a 90° angle by a mirror positioned at a 45° angle. This stacks the beams closely next to each other, giving you a larger but more powerful beam. Combining lasers of the different wavelengths once. Dichroic filters reflect a beam of one wavelength and transmit a beam of another wavelength. You can only do this once with each wavelength. You can not combine 532nm and 660nm together, then combine that beam with 660nm again. You can combine 660nm, 638nm, 589nm, 532nm, 445nm and 405nm together using dichroic filters. 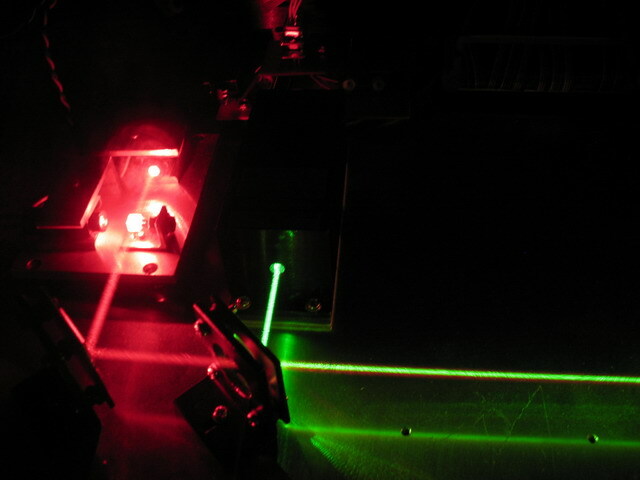 Two lasers are placed perpendicular to each other. Where the beams meet a dichroic filter is placed so that one beam passes through the filter and one gets reflected at 90° into the other beam. Can combine multiple beams with different wavelengths. Cannot be used to combine the same wavelength. Combining two lasers of the same wavelength once. Polarized beam splitters take two beams of opposite polarization and combines them together. This can only be done once; if the output of one PBS cube is shone into another it will split the beam. 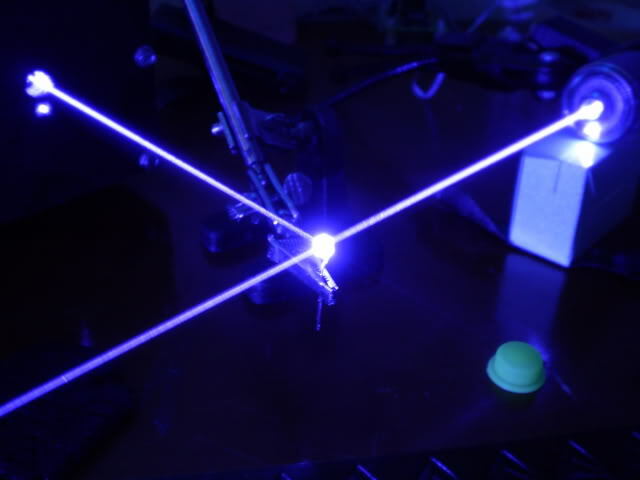 Two lasers are placed perpendicular to each other. Once module will be rotated 90° so that the lasers are oppositely polarized. 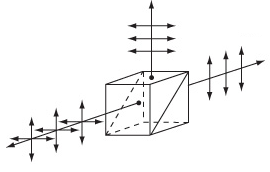 Where the beams meet a polarized beam splitter is placed so that one beam passes through the cube and one gets reflected at 90° into the other beam. Cannot be used to combine more than two beams of the same wavelength. With multi mode diode lasers one will have to be rotated 90° so that the beams are like this - and | when they get combined it will give you this beam + To avoid this you can use a 1/2 wave plate. This changes the polarization, but not the orientation of the beam so that both beams will be set up like this | and | giving you one | beam. Polarized beam splitters can be used with knife edging to combine two sets of knife edged beams. I know I have shown you this pic before, it's not my work, but it really shows how it's done. Notice how each bank is elevated so the row of knife edged beams shoot over top of the rows in front, it all gets boxed and sent through the reduction telescope and then cubed. I don't see a wave plate to rotate one sides beams 90 degrees before the cube, but as these look like single mode diodes they could all be turned a 1/4 turn in their sockets on one side vs the other, point is when you cube you need opposite polarity, that is rotated 90 degrees, but this can be solved with a wave plate, the basic setup is shown well in this image. Multi mode diodes present extra problems when knife edging, single mode diodes are much easier to work with. See how it is kinda tall !! That is because...it is two (2) bounce mirrors....one atop another....SOooo.. The beams enter the upper unit....and are bounced/directed downward....where they hit a second mirror. This second mirror then re-directs the beams...to the right....and headed toward the PBS cube. This " Bounce-bounce " travel...rotates the polarization...by 90 degree ! SOooo...entering the PBS are two distinct polarization fields...at 90 degree angle to each other....and THIS is what is demanded for the the PBS to combine the sets of beams ! Ahh yes, I see the bounce down then right on the left bank, that will rotate it all 90 degrees, I should have caught that, I looked at it before but not close. Another interesting thing is the relight scattering, beams always look the brightest coming at you, or the camera, 2nd brightest going away, but from the side where the individual diode bounce mirrors transfer to the knife edge rows moving sideways the beams are barley visible, same thing happens outdoors. I think it's doable, but alignment will be critical, and there may be some weak spots between hot spots because your not combining, just stacking beams close together. I have not done this.....but....maybe it would work ??? After all....the Keplarian Telescope set up .....used in the above many, many red LD knife edge set-up....is really a Beam expander....in reverse !!! But then....when experimenting with the Linos Beam Expander...in the Zacop build...I do know that the beam had to strike the Linos input lense....dead centre ! !....or the output was all messed up !!! I am no Optical Engineer....just a " Lens Hack ".....I again...request a true Optical Engineer....throw in here !!! One thing is for sure....if the beams remain in a parallel condition when going thru a beam expander.....Any....Any... off-axis condition will be amplified.... greatly. SOooo....your knife-edge mirror alignment is critical. Really critical, And if the spacing from beam to beam is off....well...that will been easily seen !!! And the BE is doing it's thing !! Well...in thinking about my Linos experiments...it was off-axis propagation that would not work ....so...if the pitch or yaw were off...that was a problem !!! Clearly...there are four (4) beams...entering the 4X BE...and one would assume that their aggregate / combined centre line is entering the BE dead centre !!! Beautiful work !!! IIRC....Tuned Cavity ( who built this) is outa Europe. 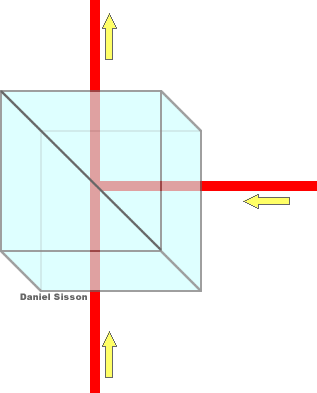 BUT...with Cylindrical correction ...or Anamorphic prism's placed in the beam path...then knife edged ...then beam expansion....one would get both beam expansion....and... less divergence ....BUT.... a larger cost/size and complicated build !! That is for sure !! Perhaps I will experiment with the Tridentis build......remember...that was a three (3) - 9mm diode .. knife edged combined....then all three beams put thru a pair of Anamorphic prism's for correction. I wonder how my Lios BE will handle that output....which was 6.7W combined optical power. As Doctor Frank N Stein sez......" It...............Could................Work " !! The best way I've found to knife MM diodes is to do the correction individually on each diode. This allows the beams to be converged at a distant point. If you knife first then go to a beam expander you will have large gaps between the beams. The gaps can be reduced by having the beams exit parallel before the expander. Unfortunately, they will not overlap in the far field in this case. when you say do the correction individually, you mean a cylinder lens pair for each diode output? Yes, exactly. You could also use an individual spherical BE on each to get a large output beam with low divergence. When you say the gaps can be reduced by having the beams parallel before the expander, you just mean to make sure they are perfectly lined up parallel with one another before entering the BE, right? The gaps might not be a problem for you. Depending on how big the output lens is on your BE and how much expansion you have. Its a problem for projectors because the "gaps" make it hard to fit a beam on the galvo mirrors. Another thing I forgot to mention.... Ideally the distance from the individual diodes to the BE should be close if you knife edge first then hit a single BE. This helps the BE focus all the individual diodes evenly. The greater the individual diodes divergence the higher the distance tolerance should be. So, a 8mm fl collimator is more tolerant than say a 4mm FL lens. This is a set-up I did that illustrates the offset needed to even up the distance..
optical set up, the closest beam to beam positioning can be achieved. more space, it produces acceptable results. NUBM07E...WHENEVER that will be !!!! with results that are consistent and follow scientific principles. You can have it all !! See the latest design NDG7475 Quad V4 !! Just bounce the bundle of beams around...like a trick billiard bank shot by using two (2) bounce mirrors. This puts you dead centre ! Which I assume you want for the Linos Unit. First bounce/steer to the right....then....bounce /steer another 90 degree...out the front door !! You will take a very small power loss ( 2% total) by adding these two (2) bounce mirrors...but....use the mirror units from Lasertrack !! I think they are the most efficient...and are available AR coated for 520nm ! Note: CRAP...Just noted the 2.7 " Wide max....and the V4 is about 3.7" wide...there may be a way to shrink it down...but...just thinking about it is catching my hair on fire !!! I have an idea for a work-around....not easy....never been done before....gotta CAD it all out to verify the feasibility !!! I suppose I could just use a single concave cylinder lens alone for each diode, as it exits the knife edge and let each of them expand into a large PCX lens to collimate all of them, but I believe they will probably just shoot out of the pointer in different directions. I don't know, maybe not, that blue 11 watt host doesn't have their beams shooting out in different directions but what I want to do, by individually expanding each beam, prior to collimation, might be a horse of a different color. Opinions? Edit: The more I think about this, perhaps I should just use correction for each beam, but in the process of correction, expand them a lot to nearly fill the 3 inch size of the output aperture, when individually stacked together. The output would be a brilliant wedge, but would have low divergence. Thinking more, to do that, there isn't enough room to put a bunch of cylinder lens pairs next to one another on the plate, they are too wide to do that for each individual beam, but I can see a way of stagger offsetting them to do that, maybe.... but the expanded beam would become blocked by the cylinder lens pair ahead of it anyway... much to think about, I guess it can't be done that way, I'd have to correct each individual beam prior to the knife edging as shown in your diagram CDBEAM! I just want the beams to go out the center of the hosts aperture as close as I can get them together, but at as low a divergence as possible, can someone see a way? Good thing I have a lot of room, but I'm not sure it will be enough, not wide enough, limited to 2.7 inches. I would use 4-6mm collimator lenses(g2 is fine). I would "stack" the beams like so ----. Not knife, as that would look like this llll. (it really the same thing, just with the diode turned 90deg). Next I would hit a 6-8X cylindrical BE. This will give a square-ish beam with already good divergence in both axis. Next run this into your regular (spherical) BE. This way you can fill the whole 3" output lens if you want. The "gaps" will not be greatly exaggerated because the "stacked" beams will not have to converge much due to their starting low divergence. This set-up has the advantage of the least amount of optics and the most symmetrical beam. Disadvantages: the tolerance before the cylindrical BE needs to be fairly good. This includes the individual elevation of each diode and the distance to the first BE. Also, the diode rotation is important. pitch or yaw were off...that was a problem !!! centre !!! .........Unless Joe and Lucy have moved they still live in Toronto..
Had the issues been between them and Regina been between just two guys I doubt so many would have taken her side--we only really heard her point of view IMHO.. we lost a great source of help over that..
How many members have a dedicated 'Clean Room' in their home..?? Aside from spending a ton of $$ on lasers, what, really has Regina done for the FORUM...? Well....Tuned Cavity makes some beautiful work !! That is a fact !!! shrink this down further....and keep all the four (4) optical trains...side by side. One could rotate the entire four pac...90 degree...stand it up...on end...so...it has a height of about 4"....and is about 1" wide !! Then....the beam C/L could be position on the host centre axis. OK...See attached pic !! Complicated...but may work ??? We break the four units....down to two...and position them side by side. SOoo...each set of two units is mounted to a T shape Aluminum bracket. The correction optics and knife edging stays the same as before. The output of two corrected and combined beams is then pointing down....toward the bottom of the bracket. It is not shown on the concept drawing...but...the side by side units will not be even...One set would be shifted forward. This would be done so that one set could have an additional bounce mirror ( not shown)....to redirect those two beams forward. SOooo...the two beams on the left hit a bounce mirror...and turn right....headed toward the PBS...and first passing thur a small wave plate to rotate the field. The two beams on the left...after being redirected forward would enter the PBS from behind. SOooo...both sets of two beams...enter the PBS....and are combined...and exit forward. This is good from the aspect that we have higher beam density by using the PBS. The combined length would be about 120mm long. I am not sure this would work....as I have not given it a sufficient amount of thought....but...for now...I cannot see why it will not work. CDBEAM, how do you do it? You have quite the mind for these things! I just woke up and need to think about this for awhile but I am impressed you found a solution.
" You must think like an Alien...On multiple levels....In multiple dimensions "
HAHAHAHA...what move is this a quote from...my fellow Beam Heads ? ?